A Halloween Treat Just for You ` awareness ribbon! – Do I Look Sick? A Halloween Treat Just for You ` awareness ribbon! I’ve talked before about my idea of wearing a shear ribbon as awareness for all the invisible diseases. When you have a chronic illness, you usually have more than one. And with awareness ribbons ranging from normal colors like blue all the way to zebra-stripes, it can start to seem kind of silly when you tote around more than one. 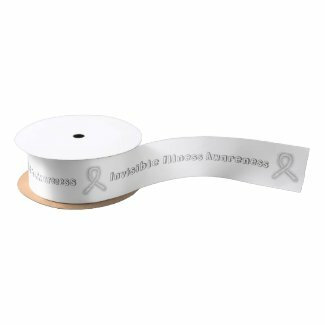 You can use this baby to loop up your own awareness ribbon, or tie it on a gift for a friend in a flare. I know that if someone brought me a “feel better!” gift with this ribbon on it, I’d feel touched and appreciate the extra thought. And since it’s the day before one of my VERY FAVORITE holidays, today you can use the code ZHOLIDAYTRIM to get 50% OFF – yup, HALF off a brand spankin new product. Happy Halloween! Speaking of Halloween, my professional photo of my costume came in! Wha-BAM. I love this photo guys. If you’re ever dressed up for a convention around here, DEFINITELY check out SuperHeroPhotos.com. I walked up all shy and not knowing what to do and the photographer was like “Alright Esmeralda, you’re a fiery character, so you’re gonna work those hips! Get a wide, strong stance because you don’t mess around with Esmeralda.” It made me feel like, well, a super hero! So spill the beans guys. What are you going as for Halloween? And if your answer is “Oh I’m not dressing up” then RETHINK YOUR LIFE MY FRIEND. We’re all about Halloween over here. We’re throwing a big candy feast (after marching in a Halloween parade) ((small town life FTW)) and costume party, and the house is all decked out with vintage Hunchback of Norte Dame streamers and faux cauldrons of fire and light up skulls and a fog machine that blows fog bubbles! IT’S GOING TO BE SO AWESOME. So tell me about your decorations, costumes, anything and everything Halloween in the comments – and don’t forget to get the ribbon for half off today only! It’s endlessly useful and I don’t normally like to mention this before Halloween but Christmas *is* coming up. Happy Hallows Eve Eve!